pre-test: Explain the test procedures to the subject. Prepare forms and record basic information such as age, gender and test conditions. Record preferred hand. See more details of pre-test procedures. procedure: Participants stand comfortably in front of the BATAK board. Light buttons are lit randomly, and the subject must strike out as many as possible in the allocated time (30 or 60 seconds). As soon as one target is struck the next target lights up. Plenty of practice is very important, as performance can increase rapidly in the first few attempts. Routines: There are several different routines that can be run on the BATAK system. Here are just a few. Batakathon — 3 minutes of randomly lit targets. The targets remain on until struck out. The user sets the pace – slow – or – fast – or – speedup. Ideal for warm-up sessions. 50 Target Race — the user must strike out 50 targets at random as quickly as possible. 50 timed targets — there are 50 timed targets which illuminate at random. The targets remain on for one second. If you strike the wrong target or strike one 'out of time' then the testspeeds up! 4 corner stretch — the user is shown 100 random corner targets and must strike out the illuminated target within one second to score a point. scoring: In the accumulator routine, the score is the number of lights that are pressed during 30 or 60 seconds. one such Batak system is installed at the playzone of the Millennium Dome in London. 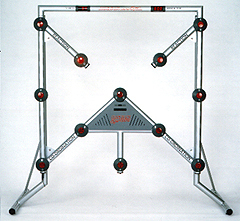 Batak have a whole range of reaction time boards for different situations, such as the more portable and reasonably priced BATAK Lite. The test described here is just one example of a reaction test that can be done with their systems. BATAK featured on the ITV series 'BODYHEAT'. At the end of each show the exhausted challengers faced the BATAK wall to test their reaction times, stamina levels and hand eye co-ordination. Reference: Image and test details are from Batak. More information is available from the official Batak website. See other coordination and reaction time tests, including the Light Board Reaction Test which is part of the SPARQ rating system for boxing. Video examples of Reaction Time Tests.